Are you looking for a place in today’s hyper-connected world where your group, organization, or business can drop down and get to the heart of the matter? 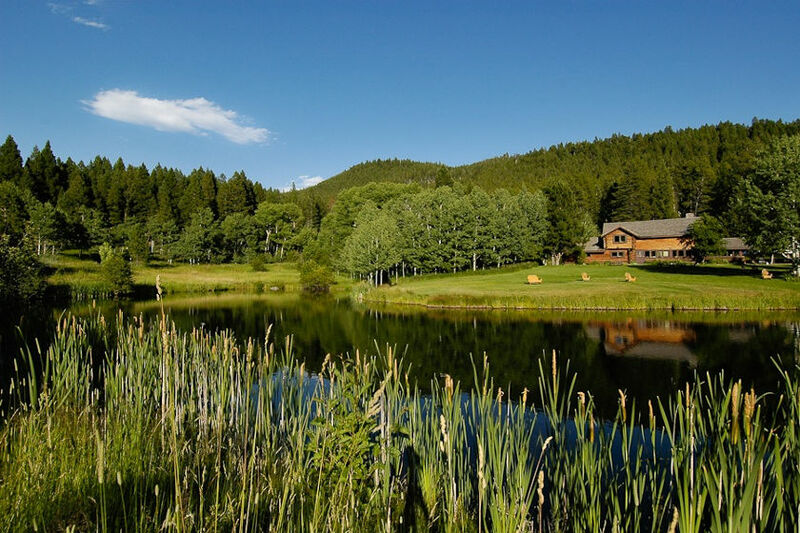 The Feathered Pipe Ranch, located just outside of Helena, Montana, offers an unequaled setting for leadership roundtables and corporate retreats where the static of the world falls away and out-of-the-box solutions can be discovered and explored. Just a thirty minute ride from Helena Regional Airport with daily connection to and from Minneapolis, Seattle, Salt Lake City and Denver, the Feathered Pipe Ranch is the perfect spot to hold corporate retreats, organization meetings, business conferences, and other special events (and yes, shuttle service is available). With beautiful gathering spaces, lovely and diverse lodging, and plenty of fresh air and space, you will quickly appreciate the force-multiplying power and wonder of the Ranch’s unique environment. We invite you to join us at the Feathered Pipe Ranch, where we have been perfecting the art of creating the ideal retreat environment for more than 40 years. 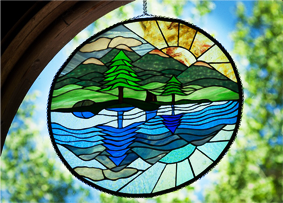 Tucked in the heart of the northern Rocky Mountains and surrounded by miles of forested mountains, we offer a vibrant and peaceful oasis in which all distractions can dissolve away and the essence of the matter comes into clear focus. The Ranch is an excellent alternative to hotel convention centers for your business or organization’s meeting or offsite retreat. 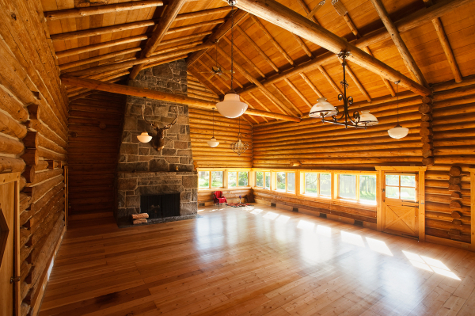 Our lodge’s main room and dining hall offer the lovely, light filled space and ambiance to inspire open discussion and collective brainstorming. The pristine natural vistas and abundant wide-open space offer opportunities to play and roam. 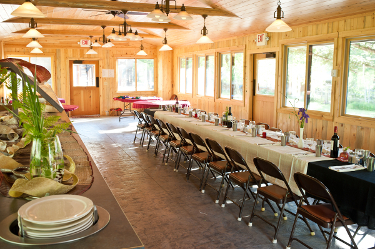 Feathered Pipe is is also a great place for family gatherings, weddings and other special occasions. At the Feathered Pipe kitchen – the heart of the Ranch – we strive to use whole, organic ingredients prepared with a commitment to health and well-being, attempting to locate locally grown and raised organic food sources as much as possible in order to play our part in building sustainable, healthy communities. 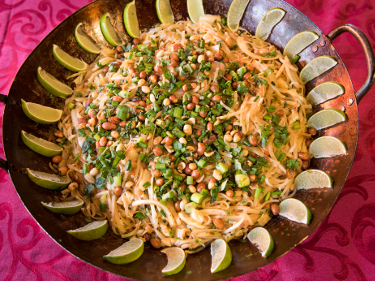 Our kitchen can design a wide range of menus for your event or retreat, from authentic western fare to international ethnic cuisine, to gourmet vegetarian and vegan. 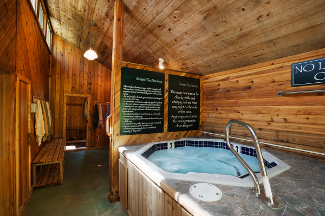 Our beautiful bath house gives your group access to a sparkling hot tub, a cedar wood sauna, and massage rooms. Our exceptionally skilled massage therapists and bodyworkers are available upon request to enhance the unwinding experience. Our practitioners offer a broad range of modalities that support our guests as they to dive into deep states of relaxation, stress relief, and healing to enrich their overall Feathered Pipe experience. Group or individual yoga instruction taught by certified teachers is also available upon arrangement. Immerse yourself in the Feathered Pipe’s pristine and limitless nature enjoying outdoor activities – hiking, fishing, canoeing, swimming or simply lounging in ease! Rates and availability for organization and group events vary depending on the dates. Main season rates start at $200 per person, per night, which includes all meals. Please Note: Because the Feathered Pipe Foundation hosts its own programs during the main season, interested groups are encouraged to inquire a year in advance of their planned event. During the Early and Late season, prices are lower and scheduling more flexible. If you’re interested in more information, assistance in planning, or scheduling an event or retreat, contact us well in advance at info@featheredpipe.com or call (406) 205-3995.